New coach Matt Golzynski, also a teacher at the school, rediscovered his love for tennis and is sharing his passion with his players. 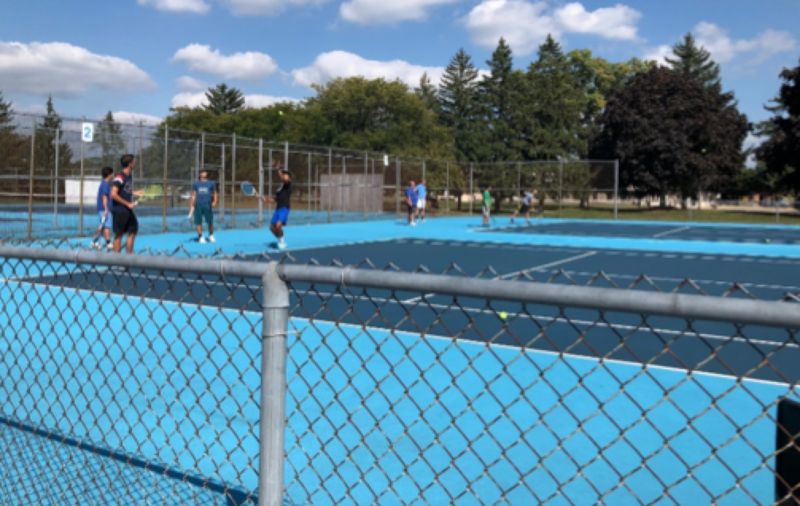 Editor’s Note: Our initial story incorrectly reported that Lansing Catholic HS tennis team had not had a history of state champion tennis players. We removed that sentence from our story and apologize for the error. LANSING, Mich. - Matt Golzynski has loved the game of tennis since he was six. He was a member of his varsity team in high school, but fell short of making Michigan State’s varsity team when he got to college. After that, Golzynski and the game of tennis didn’t connect again for a while. 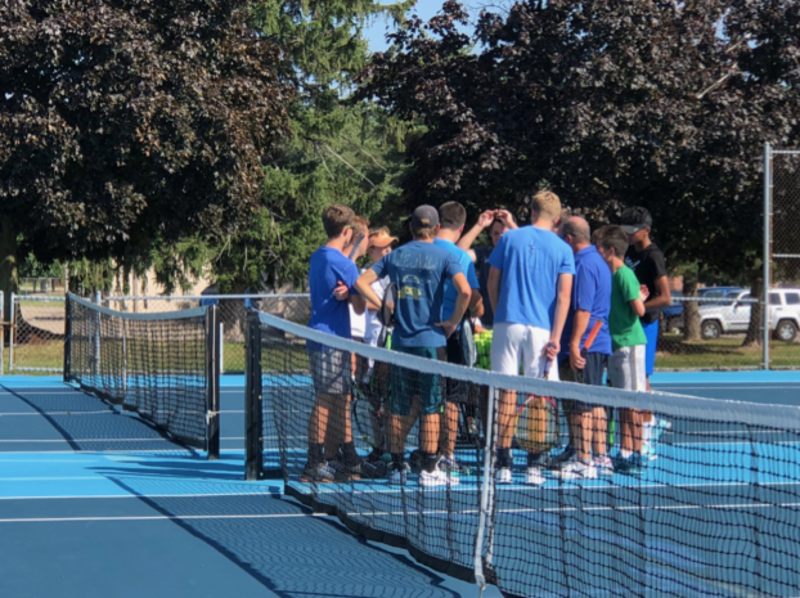 However, this past summer, Golzynski felt the spirit to pick up a tennis racket again, because Lansing Catholic high school offered him the boys tennis head coaching position. Golzynski, who also is a teacher at Lansing Catholic, hopes to see the program rise again in prominence – and ultimately to contend for their first team state championship. The team started the 2018 season 8-0. Coach Matt Golzynski talks with his Lansing Catholic Varsity boys tennis team at Varsity practice on Sept. 14 at Lansing Catholic High School. Senior doubles player Jack Wolfe sees the new coach’s impact. Senior Parrish Robart, Wolfe’s doubles partner, agrees. Golzynski has taught sophomore social studies at Lansing Catholic for six years, meaning, he had every member of his team in his classroom except this year’s freshmen. The tennis program consists of 24 players; 12 on varsity and 12 on junior varsity. Wolfe said that the junior varsity team is one of the largest Lansing Catholic has seen in years. “If they continue to stick with it and play, I think we’ll have a good program for years to come,” said Wolfe. Before Golzynski, Lansing Catholic tennis was strictly divided in practice and match settings between varsity and junior varsity. Golzynski has changed that. Not just Golzynski thinks that the combining everyone has helped the program strengthen and grow. Golzynski has seen improvement every day since the season started just over a month ago. Members of the Lansing Catholic Varsity Boys Tennis team warm up while Coach Matt Golzynski watches on Sept. 14 at Lansing Catholic High School. Improvements aren’t just seen on the court. The Cougars just passed the halfway point of their season. They are currently unbeaten in league play. Lansing Catholic has their league tournament on Oct. 4, then moving to regional tournament the week after that. The state finals are Oct. 19-20.